With an estimated 22,000 nurseries and schools worldwide and approximately 750 catering for around 30,000 children in the UK, Montessori education is a considered choice for many parents. But what are its key characteristics that distinguish it from other early years approaches? In this first of a two-part series, we explore the origin of Montessori education and some of its main features. Elizabeth Holmes speaks to Nick Peck, Montessori teacher and owner of the Bright Little Buttons Montessori Nursery School in Worthing. Elizabeth: Can you give some background on how Montessori education began? Maria Montessori was born in Ancona, Italy in 1870, and at a time when higher education for girls was discouraged she initially chose to study engineering and mathematics before undertaking medical training, becoming the first woman to graduate as a doctor from the University of Rome Medical School. Whilst caring for a group of handicapped children, Montessori found that by working with them in a particular way and using specifically designed equipment their levels of attainment came to equal those expected of the ‘national average’. The progress made by these children so impressed her that she began to wonder what effect a similar approach would have on other more fortunate children. This led her to jump at the chance to open her first ‘Casa dei Bambini’ (Children’s House) in the slums of Rome in 1907. Here she was able to put into practice her developing theories and insights as to how and why children learn, and by offering them the freedom to explore the environment she had so carefully prepared, she enabled them to release and develop their innate and undiscovered potential. The Children’s House attracted a vast amount of attention and interest, largely as a result of a seemingly ‘miraculous’ explosion into writing shown by these children from largely illiterate families. The effect of seeing these self-disciplined, industrious and happy children on all those who visited the school was so profound that her ‘method’ spread rapidly around the world. Elizabeth: I understand that Dr Montessori was a tireless campaigner for the rights of children. She was, and also for the rights of women. Montessori travelled throughout Europe, India and the USA explaining her discoveries and ideas to a diverse and ever-growing audience, and developing and extending her philosophy and work. She campaigned for a greater understanding of the ‘secrets’ of childhood, and she was nominated for the Nobel Peace Prize in 1949, 1950 and 1951. By the time of her death in 1952, she had created a rich legacy of writings, teaching materials, training organisations and schools and these have provided the foundations of a truly global method of education for over 100 years. First and foremost, in Montessori settings we create a developmentally appropriate environment, with ‘a place for everything and everything in its place’, that allows for as much freedom of choice, movement and self-expression for the children as possible. We offer a visible and constantly accessible curriculum based on equipment and materials (much of it designed by Montessori herself) that allow the children to learn independently in their own time and at their own pace. 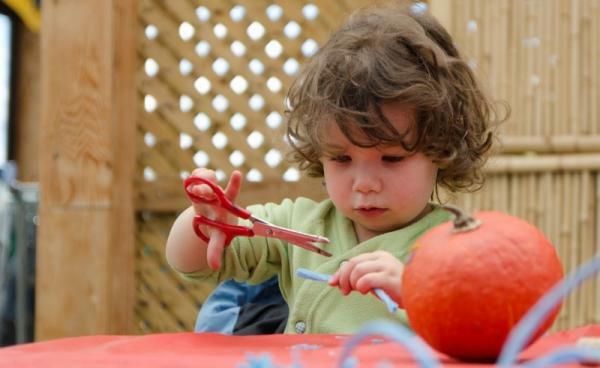 We place a great deal of emphasis on ‘real world’, practical activities and sensorial learning and the children are able to move both ‘forwards’ and ‘backwards’ through the curriculum rather than being swept along by an externally imposed timetable that pays little heed to their natural interests, rhythms and preferences. Elizabeth: That can be quite different from the structure of a day in a non-Montessori setting. Children in your nursery will be learning through spontaneous and often repeated activity and ‘indirect preparation’ for future learning. That’s right. It is this freedom of access to such carefully designed materials that provides the fundamental key to the self-discipline and the self-motivated learning that becomes apparent as the children grow and develop in a Montessori classroom. Elizabeth: Something that appeals about Montessori education is the fact that children aren’t taught in separate year groups as can be the case in other settings. The opportunity for older children to teach what they know to younger children seems too good to miss. It is. Our setting has children aged 2-5 in a mixed age class. Montessori settings always have mixed age classes, ideally ages 3-6, 6-9 and 9-12. Older children naturally begin to act as ‘teachers’ for younger children, which has benefits for both ‘teacher’ and learner, while younger children gain obvious advantages from seeing the work and attainments of children who are only slightly older than themselves. Elizabeth: It sounds as though one of the key distinctive features of Montessori education is the degree to which it is learner-centred with the emphasis on self-discipline and intrinsic motivation. That’s right. We don’t emphasise rewards, punishments and competition as a means to motivate either learning or ‘good’ behaviour. We also don’t have a timetabled curriculum so children’s activity is spontaneous. Teaching is predominantly through one-to-one demonstration rather than group or whole class teaching. Group activities tend to be initiated by the children, and so are based on mutual interest and cooperation. Elizabeth: So perhaps the role of ‘teacher’ differs from some non-Montessori settings? In a Montessori setting, the teacher acts more as a facilitator and co-worker than as an instructor. Elizabeth: So what would children do on a typical day in a Montessori setting? Our top priority for all children attending the nursery is that it is a happy and positive experience for them, which over time will play a part in helping to instil both the confidence to operate independently within a group and a lifelong love of learning. When children first arrive in our nursery, we take the time to ensure that they feel safe and secure, know where things are and how to use the activities. Then when they have settled and are beginning to feel familiar with our routines and expectations we begin to introduce them to our Montessori materials.